This is a talk page. Do not edit other contributors' comments. The guard that reports to Princess Celestia has blue eyes like other generic guards, but his eyes change to yellow after he removes his helmet. When we see Celestia at the beginning, her horn aura is yellow, like her cutie mark, but the letters have Twilight's aura color around them, making them look as if Celestia has multicolor aura colors. Both book and horn glow during the last sung line of Ballad of the Crystal Ponies as opposed to teaser edition, but Twilight's horn still doesn't glow shortly before, while the book does. Rainbow Dash's wing is upside-down when she's up the ladder in the library. When Cadance faints, her horn disappears for a few frames. Rarity's irises are not polygonal shaped when imagining herself as a crystal pony. 02:29 Cadence's horn doesn't glow when Twilight says "I will retreive the crystal heart.". On most scenes of Twilight walking down the hidden staircase it is clear that she is not standing on the stairs (either hooves standing flat in midair or she's standing at a different angle to the top of the steps). When the crystal ponies cheer for Rainbow Dash, Berry Punch is in the crowd. When Rainbow Dash says that she has a reputation to maintain, Fluttershy's ears disappear. Whenever Celestia's face is seen at an angle so that you can partially see her second eye, said second eye is normally not straight and tends to slip closer to/further from her muzzle. When Twilight looks to the top of the tower, the staircase seems to be free floating. This is fixed in the next scene. 16:59 Fluttershy is not there. 17:07 Fluttershy is also not there,while the other three are. In the last line of The Success Song ("for...this!") everypony is singing, but Twilight's mouth doesn't move. 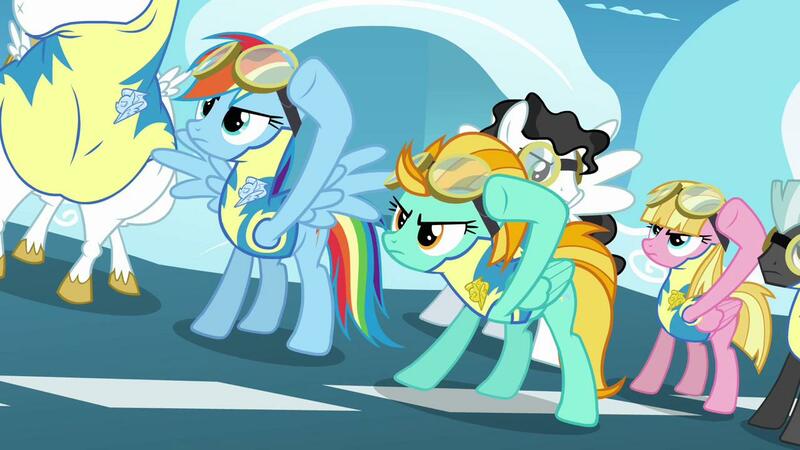 When Pinkie walks over to Rainbow Dash in her swim gear, Rainbow Dash is wingless. When Pinkie Pie first sees Fluttershy having a tea party and the camera zooms in to look at Fluttershy, her back wing is reversed. Pinkie Pie has six legs when she jumps up (06:48). When the Pinkie Clones finish cloning many Clones, in one scene there are 14 clones, in the next there are 12. After Pinkie Pie tells the clones to knock it off, the clones on the far left and right have no ears before they jump. When they jump, ears appear and clip into their mane. Their mane animation also has many errors when they jump. When the clones attack the barn, Apple Fritter is helping raise it (12:50). She suddenly changes to another member of the Apple family (Marmalade) the next time she's on scene (13:02) She changes back to Apple Fritter when the Pinkie Clones run off. When Big Mac blinks, (13:02) his eye is still visible under his eyelid. In the song, the first time the line "Everywhere we turn, she's just a step ahead" is sung, Apple Bloom is singing but if you look real closely, you can see Sweetie Belle and Scootaloo mouthing it. No it did not, one of her legs was blocked, because of the front leg. Bab's missing leg that wasn't really missing because it's blocked by her front leg so oh well. 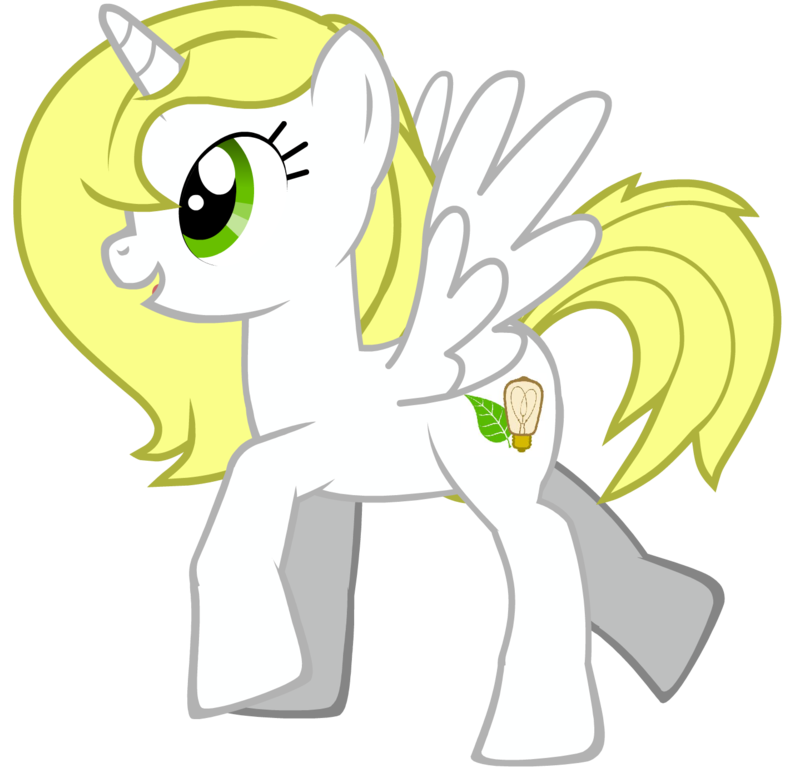 Patch is magically back on Sweetie Bell's cloak. Actually, the new aura color of magic was present when Celestia and Luna defeated King Sombra 1000 years ago, so how is the new aura version before the old one? Right after Twilight is banished (8:08), her shadow seems to be in the wrong position. As she starts running, it seems to catch up with her. At Twilight's magic show towards the end of the episode (20:32) there is a blank pony frame on the farthest end of the left bleacher. Eyes color of Sweetie Belle and Apple Bloom went wrong (17:27) and only Sweetie Belle (19:52) probably for Applejack, Rarity-like effect. For the first half of the episode, the Alicorn Amulet's head faces to the left. But in the second half, the head faces right. Actually, it's not impossible; when Fluttershy's eyes are fully open, they're round like a normal pegsus. Shoeshine closest to the Mayor (left side) has no face. At the end of Rainbow's first story with the line "And then the olden pony asks..." The colors in her main change. Let's have a normal game of checkers, please. That piece that SB just moved shifted from the force of SL's landing, but none of the others did. Hey, AB and the board weren't on the doormat! Curse you, title screen. AB's off the doormat and the board is behind SL. What the heck? 1) doormat is gone 2) board is gone 3) AB teleports 4) SB teleports. Luna's right forehoof is layered over her chestplate. Lightning Dust's cutie mark changes for a fraction of a second. That's a different dark-colored Pegasus than the one everyone's been training with. You're too young to experience mare pattern baldness, Dashie! When Lightning Dust flaps her wings, part of her cutie mark disappears. 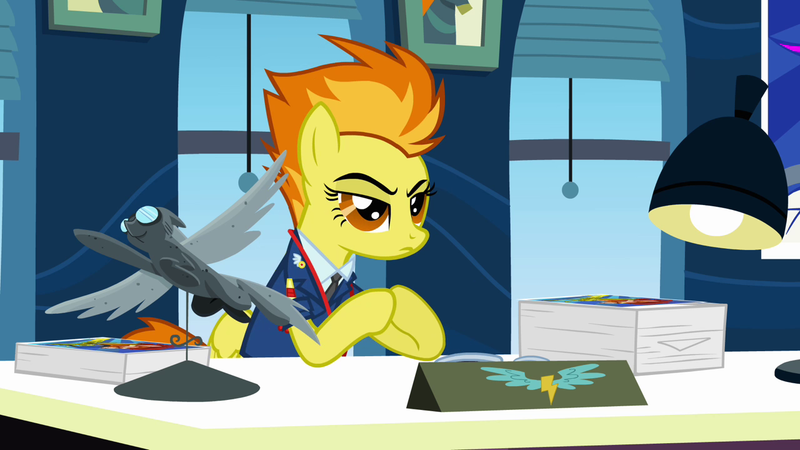 The very tip of Lightning Dust's "lead pony" badge disappears into her uniform because it's on a different layer. Two parts at the bottom of Rainbow Dash's uniform don't quite line up properly. Two of the pieces of Applejack's plot are misaligned. Pinkie Pie with no cutie mark. Dark Grey Academy Staff Member doesn't have wings. Babs Seed's eye color is the same as Apple Bloom's when they are passing a brush to clean wood. The eyelashes are Babs', but the eye color's is Apple Bloom's. This occurs in the song Raise This Barn, and stays until Babs Seed closes her eyes while singing. An error occurs again with Babs Seed's eyes having no eyelashes, but the color of her eyes are the same as the one she normally has. This happens in the same song, Raise The Barn, when it almost ends. It stays until the picture is seen in the photo album Granny Smith keeps. During the "Raise your Barn" song at 0:31 Meadow Song's eye is glitched. 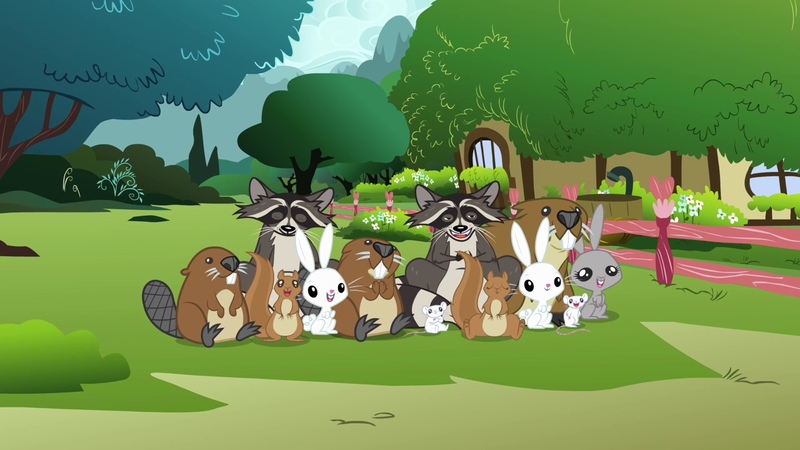 During the "Raise the Barn" song, you see a group-shot of the Apple Family. But you also see Carrot Top, Bon Bon, and Cloudchaser. Also, some of the relatives that were seen are missing from the photo (e.g. the red earth pony with the green dress, a couple stallions that look similar to Big Mac). When the family is gathering for the photo two fillies are unicorns, but they are earth before hand. On the song, "Raise This Barn," Apple Bloom's eyes are seemingly different in two scenes of the song. One line of the song (we raised this barn) is incorrect, it actually should be "we rose this barn". Granny Smith mentions she and Apple Rose were in a seven-legged race, but it actually should be a six-legged race (two hoofs are tied to you as if you have six legs). Actually no. They all have eight legs so then if you take two away you'll get six, but if you tie it together as if you have one whole leg, and add it to the remaining six, you get 7. 00:09: The second book is a red book, where at 00:05 it was a purple book. 5:39: There's a sack of grain that's overflowing on the right, but at 5:46 it's gone. at the start of the episode when twilight says "these books are gonna keep me busy for a while", her magic aura passes under the stack of books while she is to the right of them, this may be a layering mistake. At some point at Carousel Boutique, Rarity's forelock is layered over her horn. When Discord is turned back into stone in "The Return of Harmony", his face is facing away, but when Princess Celestia delivers his statue to Ponyville, his face is forward. Also the statue version is mirrored from the real Discord. When Fluttershy tries to use the stare on Discord (during the close ups of her) her wings are not flapping, but she is flying. During most of the episode, Dash's necklace faces left instead of right. 5:21, 6:21 (when Discord is spinning), 9:33, 9:50 (Discord's clones): Discord has no mane. 11:29-11:32 and 11:34-11:42: Instead of Fluttershy's house spinning, it appears as if it is going straight down. 14:00: Rarity appears to have no eye lashes or outline of the eyes. Happens very quickly, and must be viewed frame by frame. At the diner party, when the soup tureen squirts Twilight, she falls back and is eventually over backward with her ‘bottom’ in the air. Yet her tail remains on the far side of her and not connected to where it should be. 19:17: Whenever Discord leans back when skating behind Fluttershy, it appears as if his wings have detached for a moment. Rarity animation error from the episode "Keep Calm and Flutter On" at the 14:00 mark. (3:08) When Spike is talking with Fluttershy at the beginning of the episode, he has a measuring cup on his head. When his face is reflected in Fluttershy's jewel, there's no measuring cup in his reflection. The cup reappears in the very next shot. (11:10) Red animation guide arrows remain when Opalescence is playing with Gummy's tail. (18:12) Owlowiscious is inexplicably wearing a blue bowtie, which shows up again at 18:20, 19:56, and 20:39. When Fluttershy watches the pile of luggage fall off the cart at the train station and runs onboard the train, she is shown wearing her saddlebag. Yet in the shot seconds prior when Spike throws his last gem at the cart, she is not wearing it. In addition, when this same event occurs in 'Games Ponies Play', she is shown correctly without her saddlebag. At 19:53 When Spike says, "I hope you'll all forgive me someday. ", his mouth doesn't move when the camera pans to him. .At 20:04 Applejack has Twilight's eye style. Ms. Peachbottom shakes her head in surprise and something appeared. People who look closely see it and get incredibly startled. When Princess Cadence first gets out her scroll, she is holding the top of it with her magic. In subsequent shots, even though the top is not seen, Cadence's horn is not lit up with magic like it should be. In Rainbow Dash's flashback, she has no cutie mark. Hey, Rarity, what'cha using your magic on? First Fluttershy, now Pinkie? Twilight's cutie mark can't seem to make up its mind! Ms. Peachbottom's eyelid is underneath her freckles. Ms. Peachbottom's eyelid is underneath her freckles again. When Ms. Peachbottom is shaking her head from side to side, something appears for a split second. After Twilight and the Mane 6 share a group hug while wearing their elements, the ends of Twilight's tiara element have become much shorter. In "The cutie mark song", when Rainbow dash is putting gummy in a cage, there is a short moment when she has her regular cutie mark again. At the coronation we first see Cadence in the hair style rarity put her in in the last episode. Then after twilight is crowned Cadence has her hair back to her normal style. During the "Life in Equestria" song, as Princess Luna faces forward, her horn rings are a light blue and have been merged with the same color as her mane, but when she turnes to Celestia, the horn is its normal color. Applejack is missing her element briefly when they are trying to get Pinkie's original cutie mark back. In some scenes, the Crystal Ponies are normal coated instead of transparent. If you're referring to the coronation, they're in Canterlot, not the Crystal Empire. After Twilight meets up with Celestia, her tiara disappears. In some coranation scenes, the top of Twilight's mane is the same as it was before it was styled before the coranation. Near the end of the cold open, Twilight's mouth turns white for a single frame. During the coronation sequence, right after Celestira says that "Today, she did something extraordinary", Rainbow Dash has the turn of her hat on the right. Then she turns her head and it's on the left, but when she turns it back, it's on the right again. At Coronation scene, Crowning scene, Princess Twilight head turn the wrong way to see her Friends, who were the other side of her. When Twilight spreads her wings for the first time, the "break" in her bangs is missing. At ending scene of Song "A True, True Friend," Applejack change position from being in front of Twilight, to hugging Rainbow Dash. During every scene Luna is in, Her old mane is shown. This may just be on purpouse. when it shows rainbow dash's flashbacks in her eyes, the green in her mane turns gray. In A True True Friend, Rarity has gold on her body at 11:28 Also overgrown eyelashes. When Fluttershy and Twilight sing 'A friend will be there to help them see', it seems like Fluttershy's element is floating, as the sides of the necklace aren't on her neck. What happened to your hair, Princess Cadance? Gold on her and also,. oversized eyelashes. Twilight's horn is unlit. And Pinkie Pie's eyes are incorrectly gray.